The Albert Einstein Memorial is a monumental bronze statue depicting Albert Einstein seated with manuscript papers in hand by sculptor Robert Berks. It is located in central Washington, D.C., United States, in a grove of trees at the southwest corner of the grounds of the National Academy of Sciences at 2101 Constitution Avenue N.W., near the Vietnam Veterans Memorial. Robert Berks was an American sculptor, industrial designer and planner. He created hundreds of bronze sculptures and monuments including the Mary McLeod Bethune Memorial, and the Albert Einstein Memorial in Washington, D.C.
John Archibald Wheeler was an American theoretical physicist. He was largely responsible for reviving interest in general relativity in the United States after World War II. Wheeler also worked with Niels Bohr in explaining the basic principles behind nuclear fission. Together with Gregory Breit, Wheeler developed the concept of the Breit–Wheeler process. He is best known for linking the term "black hole" to objects with gravitational collapse already predicted early in the 20th century, for coining the terms "quantum foam", "neutron moderator", "wormhole" and "it from bit", and for hypothesizing the "one-electron universe". Replica of the 1979 monument in the academy garden of the Israel Academy of Sciences and Humanities. The statue depicts Einstein seated in casual repose on a three-step bench of Mount Airy (North Carolina) white granite. The bronze figure weighs approximately 4 tons and is 12 feet in height. The monument is supported by three caissons, totaling 135 tons, sunk in bedrock to a depth of 23 to 25 feet.,  It was cast at Modern Art Foundry, Astoria Queens, NY. Mary Jane McLeod Bethune was an American educator, stateswoman, philanthropist, humanitarian, and civil rights activist best known for starting a private school for African-American students in Daytona Beach, Florida and co-founding UNCF on April 25, 1944 with William Trent and Frederick D. Patterson. She attracted donations of time and money, and developed the academic school as a college. It later continued to develop as Bethune-Cookman University. She also was appointed as a national adviser to president Franklin D. Roosevelt as part of what was known as his Black Cabinet. She was known as "The First Lady of The Struggle" because of her commitment to gain better lives for African Americans. Lincoln Park is the largest urban park located in the Capitol Hill neighborhood of Washington, D.C. It was known historically as Lincoln Square. From 1862 to 1865, it was the site of the largest hospital in Washington, DC: Lincoln Hospital. Berks created two replicas of his 1979 monument. One of the replicas can presently be viewed in the academy garden of the Israel Academy of Sciences and Humanities; another on the campus of the Georgia Institute of Technology in Atlanta, Georgia.  .
Israel Academy of Sciences and Humanities, based in Jerusalem, was established in 1961 by the State of Israel to foster contact between Israeli scholars in the sciences and humanities and create a think tank for advising the government on research projects of national importance. Its members include many of Israel's most distinguished scholars. The Georgia Institute of Technology, also known as Georgia Tech, is a public research university and institute of technology located in Atlanta, Georgia. It is part of the University System of Georgia and has satellite campuses in Savannah, Georgia; Metz, France; Athlone, Ireland; Shenzhen, China; and Singapore. The Einstein Memorial seen from the side. To a visitor standing at the center of the dais, Einstein appears to be making direct eye contact, and any spoken words are notably amplified. "As long as I have any choice in the matter, I shall live only in a country where civil liberty, tolerance, and equality of all citizens before the law prevail." "Joy and amazement at the beauty and grandeur of this world of which man can just form a faint notion ..."
"The right to search for truth implies also a duty; one must not conceal any part of what one has recognized to be true." The statue was filmed and subsequently used in the opening title sequence of Sesame Street during the show's 20th season. The Einstein field equations comprise the set of 10 equations in Albert Einstein's general theory of relativity that describe the fundamental interaction of gravitation as a result of spacetime being curved by mass and energy. First published by Einstein in 1915 as a tensor equation, the EFE relate local spacetime curvature with the local energy and momentum within that spacetime. Yang–Mills theory is a gauge theory based on the SU(N) group, or more generally any compact, reductive Lie algebra. Yang–Mills theory seeks to describe the behavior of elementary particles using these non-abelian Lie groups and is at the core of the unification of the electromagnetic force and weak forces as well as quantum chromodynamics, the theory of the strong force. Thus it forms the basis of our understanding of the Standard Model of particle physics. In differential geometry, the Einstein tensor is used to express the curvature of a pseudo-Riemannian manifold. In general relativity, it occurs in the Einstein field equations for gravitation that describe spacetime curvature in a manner consistent with energy and momentum conservation. 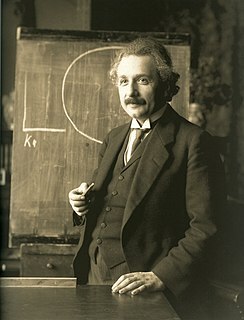 The mathematics of general relativity refers to various mathematical structures and techniques that are used in studying and formulating Albert Einstein's theory of general relativity. The main tools used in this geometrical theory of gravitation are tensor fields defined on a Lorentzian manifold representing spacetime. This article is a general description of the mathematics of general relativity. General relativity (GR) is a theory of gravitation that was developed by Albert Einstein between 1907 and 1915, with contributions by many others after 1915. According to general relativity, the observed gravitational attraction between masses results from the warping of space and time by those masses. In general relativity, a geodesic generalizes the notion of a "straight line" to curved spacetime. Importantly, the world line of a particle free from all external, non-gravitational force, is a particular type of geodesic. In other words, a freely moving or falling particle always moves along a geodesic. In general relativity, the metric tensor is the fundamental object of study. It may loosely be thought of as a generalization of the gravitational potential of Newtonian gravitation. The metric captures all the geometric and causal structure of spacetime, being used to define notions such as time, distance, volume, curvature, angle, and separating the future and the past. Planck force is the derived unit of force resulting from the definition of the base Planck units for time, length, and mass. It is equal to the natural unit of momentum divided by the natural unit of time. In differential geometry and mathematical physics, a spin connection is a connection on a spinor bundle. It is induced, in a canonical manner, from the affine connection. It can also be regarded as the gauge field generated by local Lorentz transformations. In some canonical formulations of general relativity, a spin connection is defined on spatial slices and can also be regarded as the gauge field generated by local rotations. A theoretical motivation for general relativity, including the motivation for the geodesic equation and the Einstein field equation, can be obtained from special relativity by examining the dynamics of particles in circular orbits about the earth. A key advantage in examining circular orbits is that it is possible to know the solution of the Einstein Field Equation a priori. This provides a means to inform and verify the formalism. In the theory of general relativity, a stress–energy–momentum pseudotensor, such as the Landau–Lifshitz pseudotensor, is an extension of the non-gravitational stress–energy tensor which incorporates the energy–momentum of gravity. It allows the energy–momentum of a system of gravitating matter to be defined. In particular it allows the total of matter plus the gravitating energy–momentum to form a conserved current within the framework of general relativity, so that the total energy–momentum crossing the hypersurface of any compact space–time hypervolume vanishes. Alternatives to general relativity are physical theories that attempt to describe the phenomenon of gravitation in competition to Einstein's theory of general relativity. Non-exact solutions in general relativity are solutions of Albert Einstein's field equations of general relativity which hold only approximately. These solutions are typically found by treating the gravitational field, , as a background space-time, , plus some small perturbation, . Then one is able to solve the Einstein field equations as a series in , dropping higher order terms for simplicity. In quantum gravity, a virtual black hole is a black hole that exists temporarily as a result of a quantum fluctuation of spacetime. 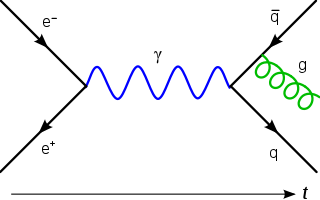 It is an example of quantum foam and is the gravitational analog of the virtual electron–positron pairs found in quantum electrodynamics. Theoretical arguments suggest that virtual black holes should have mass on the order of the Planck mass, lifetime around the Planck time, and occur with a number density of approximately one per Planck volume. In comparison with General Relativity, dynamic variables of metric-affine gravitation theory are both a pseudo-Riemannian metric and a general linear connection on a world manifold . Metric-affine gravitation theory has been suggested as a natural generalization of Einstein–Cartan theory of gravity with torsion where a linear connection obeys the condition that a covariant derivative of a metric equals zero. Lagrangian field theory is a formalism in classical field theory. It is the field-theoretic analogue of Lagrangian mechanics. Lagrangian mechanics is used for discrete particles each with a finite number of degrees of freedom. Lagrangian field theory applies to continua and fields, which have an infinite number of degrees of freedom. ↑ Owens, Trevor (2012). "Tripadvisor Rates Einstein: Using the social web to unpack the public meanings of a cultural heritage site". International Journal of Web Based Communities. doi:10.1504/IJWBC.2012.044681. 1 2 3 "The Einstein Memorial". The NAS Building. National Academy of Science. Retrieved 9 April 2013. ↑ Braukman, Stacy (10 Dec 2015). "The Art of Genius". Georgia Tech Newsroom. Retrieved 12 Feb 2016. ↑ "Chocolate Einstein". Physics Central. American Physical Society. Retrieved 19 June 2016. ↑ Freed, Benjamin (July 19, 2012). "Albert Einstein Memorial Gets Yarn-Bombed". DCist.com. Archived from the original on 10 October 2014. Retrieved 9 April 2013. Wikimedia Commons has media related to Albert Einstein Memorial (Washington, D.C.) .